The headline for this blog could have been worse. Much worse. I'm sure thinking worse. I'm also thinking: "I'm paying nearly $20,000 a year for this?" This O.U. dad has had it. This is my third piece on Palmer Fest. It's my last. My disdain for the [INSERT NAME HERE] fests at O.U. is now firmly established. On May 8-9, 2010, according to reports, 104 people were arrested, including 45 Ohio University students. Add these: Tear gas. Injuries. Riot police. For at least the second year in a row, beer bottles were thrown at police. One police officer was injured this year. Come on, O.U., its past time to do something about this. The reputation for being a party school is now a thing of the past. 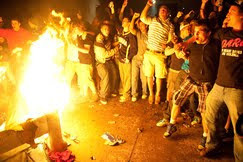 Sadly, consider your school the nation's top riot school now. Background for riot school status courtesy of YouTube.